Dyna-Ski Boats: The true cost of restoring an old 18' Hydrodyne or 20' Hydrodyne? The true cost of restoring an old 18' Hydrodyne or 20' Hydrodyne? We fix and restore fiberglass boats in the boat shop. Keep in mind that most of the time the biggest cost is labor! Over the years we have done everything that you can imagine from simple buffing to complete rebuilding. Transom, floors, stringers, little holes and real big holes . . . . real big holes! Over the last couple winters we have done various things on my banker friend's older 18'. It had been a ski team twin many years ago. The owner said that the boat needed seats, dash cleaned up, extra holes on the dash filled and holes filled in the motor well area, etc. It did not need major work! 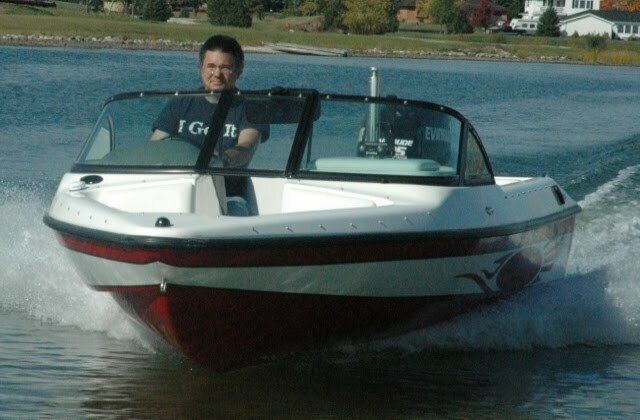 He liked our Dyna-Ski back seat and side panels in our recreational Dyna-Ski Boats. He wanted a pylon that took up less room. The 18' boat did not need stringers, floor or transom work so nothing major. I'm pretty sure it got new carpet. Well before he got the old 18' it was made into a single. Someone else redid the transom along the way. He has a late model 175 Mercury Optimax for power. It has plenty of get up and go! I told him that a new Dyna-Ski 17.6 would be a better investment of his money and he might have more in fixing up the old "family" ski boat than a new one would cost. The family convinced dad to fix up the old ski boat! According to the owner the only thing it needs now is paint. Although it looks good in the couple pictures that I have it is what I'd call a 50' boat. Looks great from 50' (and in pictures) but not close up! So far he tells me he has spent about $10,000.00 doing the upgrades. He has done none of the labor himself. All he has done is bring the boat to the shop tells us what he wants and returned to pick up the boat when the work is done. The boat was there for two winters so far. Our labor rates are reasonable (I am told) and since we do these projects as time permits our margin (profit) is very low. BUT most of the project has been labor. Another good water ski friend shared the following information with me. He has been following this rebuilding story on another website. I think it is time to tell any prospective restorers what this kind of project costs in dollars and materials. I did not keep exact records because I don't care but I did keep rough records. A guy on Hydrodyners bought a "clean" 1972 18 footer! Ended up that it was rotten from leaky fin area. He has been restoring - here is the cost so far, without gel/paint. All the labor he has provided. $1450 - largest expense for 7 Bluewater 26 Coosa boards 1/2" x 4 x 8'. Transom and stringers have eaten 3+ sheets. The 3+ left should be enough to do the floor. $460 - 6 1" thick Divinycell H80 core material 4' x 32". $250 - ATC 72 core adhesive. I had to buy a 5 gallon bucket which is double what I needed but I have some creative uses for leftovers such as bonding the floor to the stringers. 15 gallons of polyester resin. I can get the stuff for $20/gal (plus shipping) and I have just shy of 3 gallons left. I will need probably 3 more to finish. 10 yards of 17oz 45-45 biax cloth for $90. All used and I will buy another 10 yards shortly. I also bought fiberglass matt (more than I need) and fiberglass tape for tabbing (more than I need). There was alot of small buys of materials which I have kept a rough track of. Bottom line at this point is that I have $3600 into this boat and a hell of a lot of work. I think that another $500 will finish it. Then I have to send it to the local boat builder to have it Gel-coated (don't know what that will cost) and then fitted with steering, fuel tanks, instruments, and controls all of which I will do. And seats and carpet and a ski pole. I hope to give my local boat builder my leftover materials for a price reduction on the gel-coat job. After I wrote the initial posting it turns out the guy doing the restoration reads my blog and was parts shopping from Dyna-Ski. He offered to send me pictures of the restoration, additional information, etc. 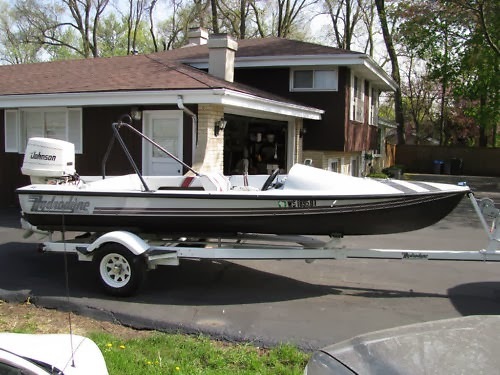 So here is the boat he purchased. It looks pretty good for an old 18' Hydrodyne. TJ even shared a comment that you should see with this information. I'm going to make another posting in the future using more pictures of his long restoration project. Hopefully it will include on the water pictures but I have a feeling it will be awhile. Below is this is the newest picture I got from TJ. Dyna-Ski Boats have no bracing on our hulls and none is needed for 900 horsepower. The transom is a little over 3" thick on a 20' Closed Bow Dyna-Ski. The deck and floor are important to the strength of a Dyna-Ski Boat. 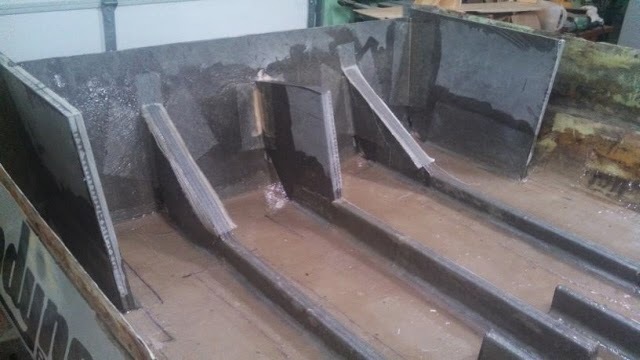 So when you take the top story and add the bottom story together you should get a feel for the dollars and time it takes to do a restore on an old fiberglass boat. We are not the boat builder the guy in the second story mentions. Gelcoating an older boat properly is very expensive. A quality paint job where the painter turns the boat over and paints the hull bottom and then the deck is the best way to paint a boat. It is also expensive but not as much as Gelcoating an old boat. I think painting and old boat is the best way to go, period! The second guy needs at least $2000 for the stuff to rig a single engine with hydraulic steering, controls, cables, wiring, gauges, GPS Speedometer, etc. Much more if he wants two engines. No mention of a trailer expense in either story. A transom, stringers and floor can cost $6000 when done in a boat repair shop if you want a solid well done boat. If it is done as a cosmetic fix like a body shop would do it should be cheap and last a short time if you are lucky. And in the end you still have an old boat. Unfortunately old boats are not going up in value like older cars are thanks largely in part to the car auctions on the TV! I keep getting calls for parts and pieces for older Hydrodyne boats. Some people are shocked by the cost of custom seats and interior parts. Shipping is expensive also. I'd bet they go with cheap seats from online catalogs that they sell. Buying a new Dyna-Ski isn't such a bad idea many times. I should mention that while rebuilding an older boat may be fun it can take a long time. It is more fun driving and skiing behind a New Dyna-Ski boat than rebuilding one.